Ok, after staring at my project bag of fabric and the pattern (purchased in late 2016) I have decided it had simmered long enough and now it is time to tackle this project! I cut out all of the pieces and sorted each into a ziplock sandwich sized baggy writing the number of pieces and the size per bag. I used a Sharpie to label each bag. Cutting Instructions were clear...I got the calculator out to maximize each strip cut per strip. Was not too bad. Eliminated waste. NOTE: An efficient cutting chart by the designer would have been helpful. If I wasn’t lazy I would have made detailed notes. I might still do that.....My apology! I sewed the Walls of Jericho blocks together. (5). DONE! Carefully Read each step. The illustrations are great! Check off each completed step. As I pieced together the individual parts together I reused the main baggy and labed it by the pieced letter. A, B, C, etc. I then labeled each baggy above “Jericho”. (just in case I make this project again....the verdict is still pending). Lol! Sew the San Luigi block (4) , add the borders...DONE! This weekend I will sew the San Luigi blocks (4 blocks) . If I come across any additional tips for this block, I will add another post. I don’t anticipate any though. the pattern/project looks intimidating. Read the instructions, organize your cut pieces, take your time completing each step, check off each step as completed. Don’t let this project overwhelm you! One step at a time! This is not on my bucket list but I would love to see yours. Will you post pictures? I made one for my son in purple and gray. Went slow....read and reread directions. reread directions...checked pictures! it turned out beautifully! It was not on my bucket list either. My husband saw it on Facebook and asked me to make one for him. I will post a photo when it is completed. Thanks for posting this. My husband wants me to make this for him too. Don't forget to get the corrected instructions online!! My pattern is the corrected one. Thanks for the heads up. Another tip......chain piece each block section. Goes quick! I clocked 1 hour or less per completed “section” . I started mine last week. I cut the stripes out. and made Jericho without a problem. Then started on San Luigi, and got to where I was adding the last section on the right when it didn't match. I'm going to have to see if I did that last side section the wrong size along the way. Now I'm hoping I have the corrected instructions. Can't wait to see your pictures!! San Luigi has slowed me down. I was derailed by straightening up my sewing room! Lol! I got about halway done sewing them together tho. No hurry but I expect to finish my “walk” this weekend. Just finished quilting mine, dark brown batik with a lighter tan, gold backing. I will be putting the binding on it in the next week or so. 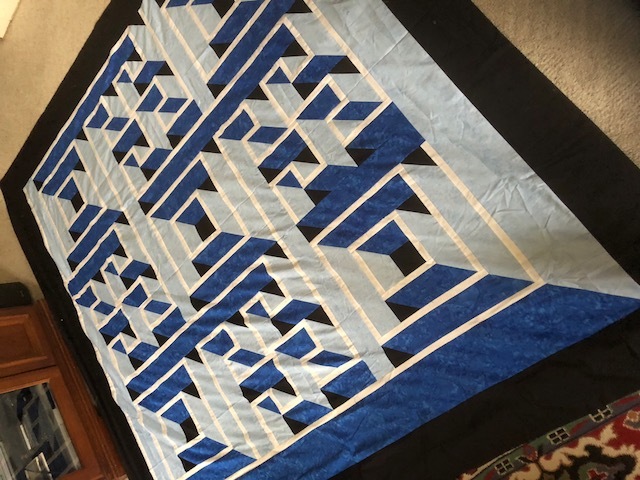 Didn't consider it a really difficult or intimidating quilt; just take your time and follow the instructions one step at a time. I hand-quilted mine, and it took 2 complete spools of thread to do so - very densely quilted, maybe too much. Will post a picture of the finished product very soon. Should have the final border on mine tomorrow. I took a couple of weekends off to sstraighten up my sewing room. Glad I did! Nothing new to add to “tips”. The patterm is written well. Just take your time with it and don’t try to rush. Really not a pattern you can ripush through. When I got tired...I quit sewing on it. Ruby, thank you for summing up your impressions up. I feel the same way. I am hopeful that once mine is quilted and DONE ..The image will be what it should look like. Right now...not convinced. 🤫. Just finish it..then we can compare our results! I have my top finished. It's now ready to quilt, I have 5 to quilt, sigh. The only tip I can think of is to make sure your fabric has enough contrast between each other so you will end up with the depth of the block. 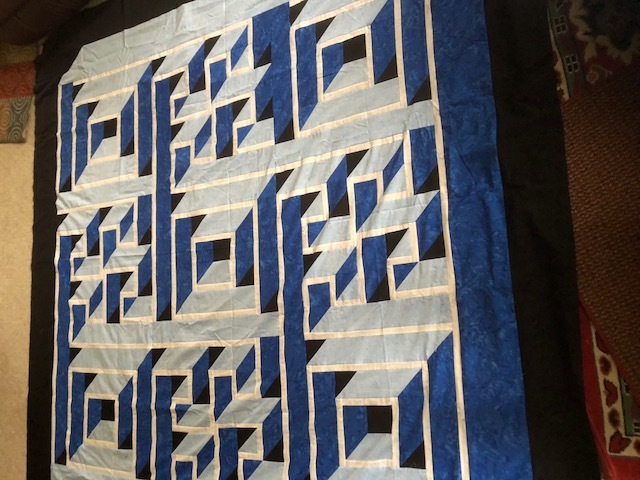 It really is a beautiful quilt. Threadhead..mine does. I finished it last night. Layed it on the floor...looks better. It will be quilted in a couple of months. My long-armer has quite a few quilts ahead of me. I will giveit to my husband when it is done. He requested it. I am HAPPY that I got this done. It went quicker than I expected. It was a lesson for being very organized from the beginning, being mindful of detail, a lesson in patience. The only “regret” is that I should have tackled it sooner! Would I make a second one? Maybe. I will post a picture of the top. Hubby wants additional borders so that it covers the box spring....just thought I would share “as is” for now. Yes it needs a good pressing and quilting...... Finished this top a week ago. Whew! Last edited by Sandygirl; 07-22-2018 at 10:01 AM. That's terrific...very effective. You must be pleased! I AM! And thank you! Glad to get it mostly behind me.